It’s so tempting to have an opinion about everything. I like my thoughts. I like my ideas. I also like other people’s thoughts and ideas…most of the time. safe, cared for, forgiven, no shame… even for those who don’t know Jesus. This is the new “set apart” blown in by the Spirit with tongues of fire 2000 years ago to create the Church. There was an old way: circumcision and rules, tribes and separateness, temples and places more holy than others. With the arrival of this Spirit there is a New Way: a community of Agape meals, fruits like self-control and kindness, living and sharing assurance of forgiveness already won. Not looking for a battle or by putting aside outsiders, but by sacrifice, dying and rising, and abiding, resting in Jesus and what He brings into our lives. I think this abiding might be a giant, glaring missing piece of the puzzle in making our churches safer places people want to be. While the church on earth will always be full of sinners - you and I alike - the presence of the Spirit can do miraculous things in our sin, our struggles, and our brokenness. The Spirit doesn’t shy away from people or pain. These things are His jam. When Jesus Christ ascended to heaven and the Spirit came down, His intention was to take up residence not in perfect, extra-special, less-sinful hearts, but into hard, lonely, torn-apart hearts, and really, really messy people. As Spirit-bearers we can walk into it too. In a world with cancer, mass shootings, abortion, disregard for the elderly, wars, children without families, and disasters that shake the earth, people are hungry for abiding. And abiding looks mostly like keeping our mouths shut and our arms open. It is safe when I hear your story without interrupting. It is safe when I make time for you in my schedule to be together without a program or a purpose. It is safe when I sit beside you without telling you my opinion on life, the state of the government, or what families should look like until you have had a chance to share thoughts with me. Of course people need Truth in all the Love. This is part of the Spirit’s work on this earth in His people. Of course we can’t ignore sin and its weight. The love of Jesus that abides in us is the same love that fights for things that matter, but it does so most often by receiving little children, and by little children I mean people, just people. We abide when we: tolerate one another, love one another in the beautiful and the ugly of life, use words and actions of respect, pay attention to individual and family needs, support, sit with, notice, and remain even when I don’t like what you look like, act like, or talk like, and when you feel the same about me. Abiding is about God reaching you, not my words reaching you. It’s about sharing the Word, talking about what He said and who He is, not what I think. abiding starts, as well as cements, relationship, while opinion is relationship’s doom. 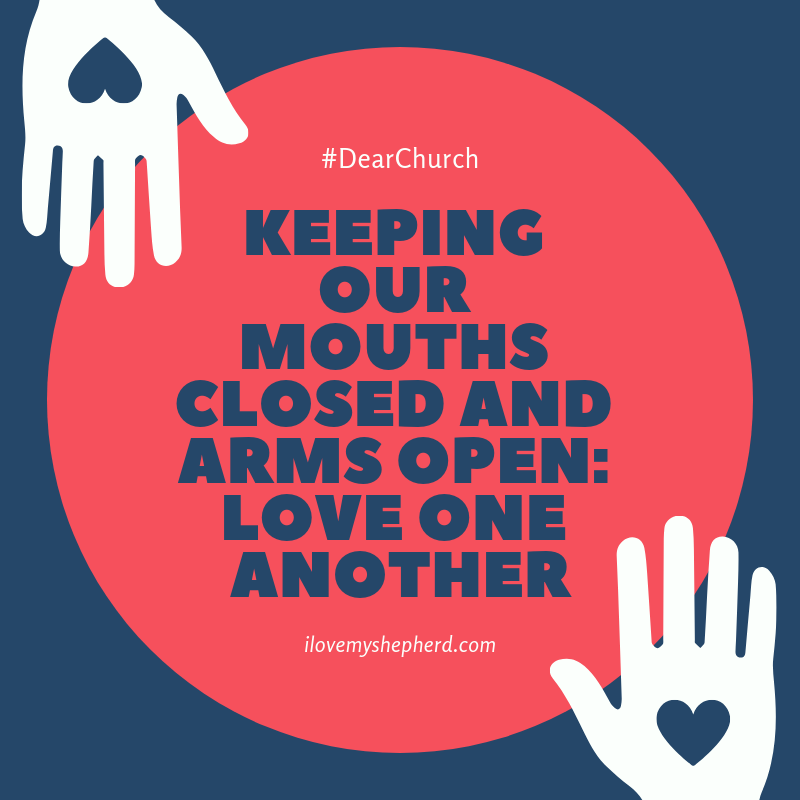 Is it possible it’s time to spend more time keeping our mouths closed and our arms open? We have the chance to invite people in. We have the opportunity to let people feel heard, but this will never happen when our own voices are so darn loud. Who could use some abiding today? Who can you sit with, walk beside, hold in honor, and welcome to the safety of conversation? The Word will be heard. Justice and Mercy entwined need to be shouted from the rooftops, but we can’t skip the abiding. Without the safety, there are only words tumbling out, with no arms to catch one another when we fall, and we will all fall. Dear Church - Let us pour out the Spirit in listening ears and sitting alongside, as much as we pour out words and opinions. Let us offer safety and warmth, relationships of hope and help, healing and strength in our Savior.